We run training sessions for occupational health staff, both within the NHS and in a general occupational health setting. Perhaps not surprising given the Olympic Sport origins of the programme, that many of the staff we train inside the NHS, (family doctors, psychiatric nurses, general nurses, addiction nurses, managers) use the programme personally to increase their resilience. Mental Training has been used in large multinational companies in Sweden over many years. We have 9 years of experience in doing workshops in varied settings, these are always enthusiastically received. Below are details of studies using Positive Mental Training in the Workplace. 1. Positive Mental Training in an Occupational Health Setting. A study reported in 2010, by Dr Jacqueline Thompson showed statistically significant improvements across all indices investigated – i.e CORE, Burnout and Depression and Anxiety. 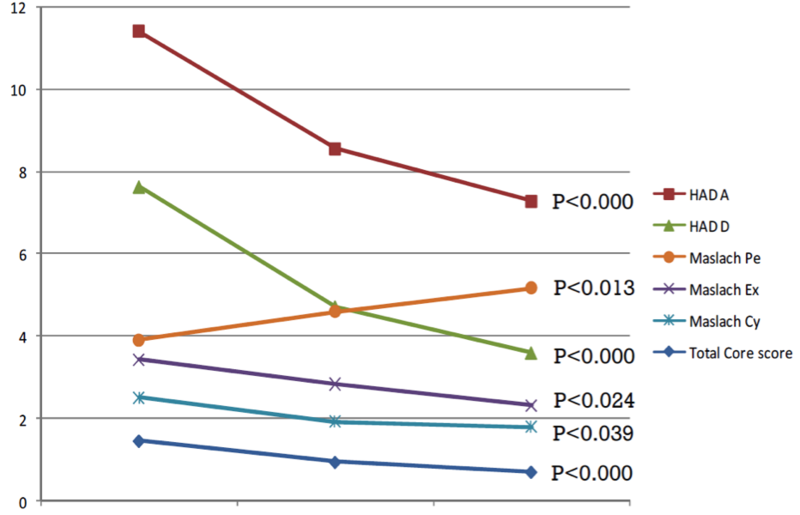 Graph showing statistically significant improvements in the Maslach Burnout Inventory, CORE (Clinical Outcomes for Routine Evaluation) and HADS (Hospital Anxiety and Depression Scale). Statistically significant improvements for all 6 variables at both 4 and 26 weeks shows that, as Positive Mental Training is a 12 week programme, listening to the programme starts to have a beneficial effect almost immediately, and continues to have a beneficial effect after the programme has been completed. Here is a link to a scientific poster describing in full her research and results. The graphs below are taken from her research. Dr Jacqueline’s scientific poster on Positive Mental Training in an NHS Occupational Health Setting. 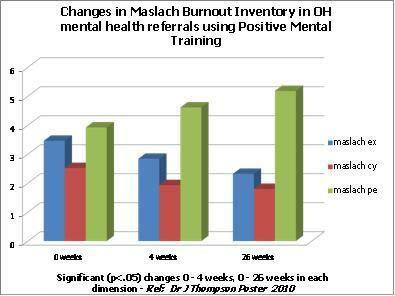 This graph shows significant changes in all indices of the Maslach burnout index for mental health referrals in occupational health. The changes are significant at both 0 – 4 and 0 – 26 weeks. 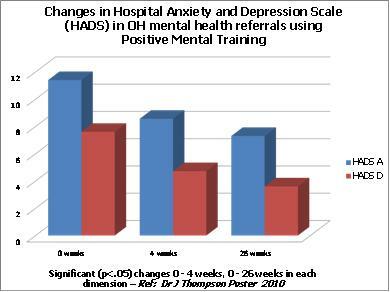 This graph shows a significant reduction of the Hospital Anxiety and Depression Score (HADS) for those referred to Occupational Health and given PosMT. The changes are significant at both 4 and 26 weeks. Significant changes (p <.05) at 0 – 4, 0 – 26, and 4 – 26 weeks. 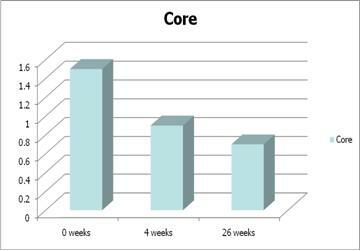 Graph showing statistically significant improvements in CORE (Clinical Outcomes for Routine Evaluation) between 0 -4 weeks, 0 – 26 weeks and 4- 26 weeks. Statistically significant improvements in the Maslach Burnout Inventory, CORE and HADS are very positive outcomes. Reducing burnout and improving stress, anxiety and depression in the workplace can increase an individual’s ability to cope, work well, and feel better, thereby reducing sick days. Statistically significant improvements at both 4 and 26 weeks shows that, as PosMT is a 12 week programme, listening to the programme starts to have a beneficial effect almost immediately, and continues to have a beneficial effect after the programme has been completed. Qualitative interviews from a study investigating the use of Positive Mental Training with healthy volunteers in the workplace, found that listening to Positive Mental Training conferred a number of advantages over listening to the background music alone. Interviewees described being better able to relaxation, sleeping better, feeling that they had learnt skills to relax so that they would be able to relax in the future, having increased confidence and increased ability to cope at work and home. Below are some extracts. I’m just more relaxed about things now and I know I can cope with change, if I’m feeling down I know how to cope with it, I can go and relax myself, I can withdraw and you know use information I’ve learnt from the , I’ve got tools, coping tools now that I can use. I think it’s (the benefit) stayed at that level, I was thinking maybe as time went by you would go back into your old ways or whatever but no I don’t think so, I think it’s like you’ve learned something and it stays with you.